The five Arctic countries—the United States, Russia, Norway, Canada and Denmark—all have areas surrounding the North Pole, but only Canada and Russia had indicated an interest in it before Denmark's claim. Lidegaard told the AP that the Arctic nations so far "have stuck to the rules of the game" and he hoped they would continue to do so. In 2008, the five pledged that control of the North Pole region would be decided in an orderly settlement in the framework of the United Nations, and possible overlapping claims would be dealt with bilaterally. Interest in the Arctic is intensifying as global warming shrinks the polar ice, opening up possible resource development and new shipping lanes. The area is believed to hold an estimated 13 percent of the world's undiscovered oil and 30 percent of its untapped gas. Lidegaard said he expects no quick decisions, with other countries also sending in claims. "This is a historical milestone for Denmark and many others as the area has an impact on the lives of lot of people. After the U.N. panel had taken a decision based on scientific data, comes a political process," Lidegaard told The Associated Press in an interview on Friday. "I expect this to take some time. An answer will come in a few decades." 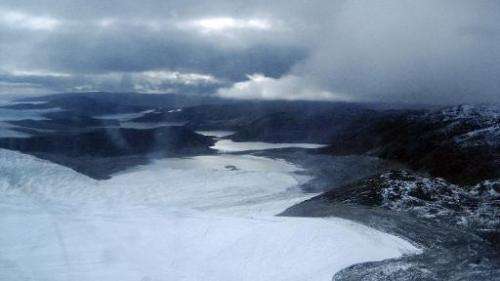 Between 2007 and 2012, Danish scientists with colleagues from Canada, Sweden and Russia surveyed a 2,000-kilometer- (1,240-mile-)long underwater mountain range that runs north of Siberia concluding that Greenland, a sparsely populated huge island that is a semi-autonomous Danish territory, is geologically attached to the ridge. That prompted Danes to claim the right to exploit an area of 895,000 square kilometers (345,600 square miles). "The Lomonosov ridge is the natural extension of the Greenland shelf," ''said Christian Marcussen, a senior geophysicist with the Geological Survey of Denmark and Greenland. "Coincidentally, the North Pole which is a tiny, tiny abstract spot lies in the area."